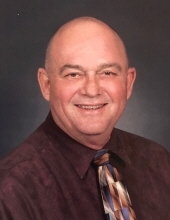 On April 6, 2019, William J. Holcomb appeared at Heaven’s Gate. Bill resided in Fayetteville, Ga with Sandy, his wife of fifty-two years. He also leaves behind a daughter, Angie McClanahan; son-in-law, Matt; and his adored grandson, Nolan. Bill is survived by his brother, Jerry Holcomb and numerous nieces and nephews. Growing up in Peach County, Bill excelled in academics and was valedictorian of his high school class. He graduated from the University of Georgia with a degree in pharmacology. At UGA, he met the love of his life, Sandra Rountree. Bill and Sandy were blessed with Angela, their only child. Bill Holcomb was the ultimate husband, father, and Poppa. In earlier years, he favored home improvement projects, building in his workshop, and coaching Angie’s softball team. In later years, Bill revelled in time spent with Nolan, theater trips, and a good book on the front porch. He and Sandy relished trips to the mountains and the beach where they enjoyed the nature that surrounded them. Bill was a pharmacist in Fayette County for forty years. The level of service, knowledge, care, and commitment that he brought to his job was astounding. Known as Mr. Bill, he was called upon countless times, at any hour, and it delighted him to assist people. To members of this community Mr. Bill was a friend, a confidant, and nothing short of a Godsend. Bill Holcomb will be missed by all that had the privilege of knowing him. To send flowers or a remembrance gift to the family of William "Bill" James Holcomb, please visit our Tribute Store. "Email Address" would like to share the life celebration of William "Bill" James Holcomb. Click on the "link" to go to share a favorite memory or leave a condolence message for the family.